Recently my husband, some of my family and I were camping in Kananaskis Country and on one of our trips in the area, we came across two ladies who were plein air artists. For those unfamiliar with that term, it means they were painting outdoors rather than in a studio. The ladies were very approachable and, because of my love of art, we got to visiting while they packed up for the day. They painted oil landscapes and from the few paintings I saw, I could tell they were accomplished at it. After we finished talking art, we began to discuss other things, one of which was where they were from. It turns out one grew up not more than fifteen miles from where we live, and she and I had an artist friend in common. Cool. Anyway, because we hit it off so well, we became Facebook friends. I love it when I make an immediate connection with someone. Kindred spirits, as Anne Shirley would say. There’s a video of plein air artists in which you’ll see my new Facebook friend, (she’s wearing the wide-brimmed, straw hat and teal jacket) and our friend in common, wearing a black jacket with a white scarf. Since I’m not certain if they’d like their name mentioned, I won’t. You should find the video easily: CTV Calgary: Plein Air Artists in K-Country. Of course you’ll have to put up with a bit of an ad first. Go figure. No doubt about it. I’m guilty of neglecting my WordPress blog site. I do apologize. I honestly can’t believe just how fast the time has passed since my last blog. But I have been writing, just not here. I’m currently working on two novels at the same time, one historical and one contemporary. I wish I could write faster than I do, but I can’t seem to rush the process. With two novels on the go, if I get bogged down with one, I switch to the other. I have a feeling that both books will come out at the same time. When that will be, I don’t know. I actually thought the historical one would be done by now. Thank goodness I don’t have an editor hounding me. Of course, maybe that’s exactly what I need. I often write better under pressure. So I beg your forgiveness and I’ll make a better effort. I can’t believe that it’s been six months since my dear mom passed away. Time moved on, I guess, even though my world stopped for a while. I want to post a few more of Mom’s paintings. It’s my way of honoring her. I apologize for the slightly off-kilter photos. 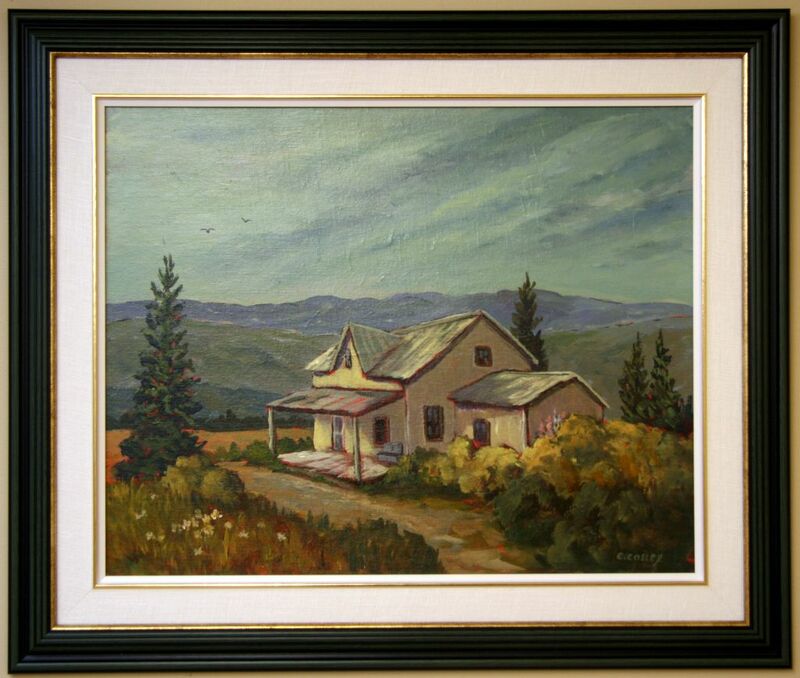 The images of Mom’s paintings were originally taken for cataloging purposes rather than showcasing. My, how the world has changed! With today’s technologies, we can be connected with friends from all over the world practically in an instant. I remember my grandfather telling me many years ago that the world was changing so fast, he could barely keep up. And that was before the personal computer saw the light of day. But I understand how he felt, because some days I feel I can’t keep up either. Maybe I have an old soul. A hundred years ago, pioneers could only connect with others by one type of social media. It was called getting together and talking, face to face. People worked hard in those days–not that I’m saying we work any less–but they made time to connect with their neighbors, family and friends. They didn’t Skype, or have Face Time. They couldn’t email, or even phone someone. They simply hitched a team of horses to a wagon or sleigh and traveled to a neighbor’s farm for a visit. They appreciated their friends and took time to nurture their relationships. As well as visiting, they also organized group events to keep in touch. The box social was a major function held in the fall after the harvest was finished. It gathered friends and family from the four corners of the district together in one place, usually in the one-room schoolhouse. At the same time they raised money for the upcoming Christmas Concert. A box social was a simple concept. The women packed a lunch, wrapped it in some creative manner, and secretly took it to the social. The men would bid on the boxed lunches, and the woman who prepared the lunch would share it with the winning gentleman. More often than not, a husband knew which lunch was his wife’s, but there was usually a prankster in the group who loved to mix things up. Sometimes the outcome was good, sometimes not. In my recently re-released book, Stubborn Hearts, the young school teacher has packed a lovely lunch for the box social. She wonders who will be the winning bidder. Will he be the blue-eyed Norwegian she rather fancies, or perhaps a father of one of her students? Or will he be that interfering, insufferable blacksmith she so despises? And who is that man funding the most hapless bachelor in the district? But no matter who buys the teacher’s lunch, he’ll be treated to some interesting conversation and delicious food. Maybe the pioneers had the best means of communication after all. I recently said goodbye to Mom, a wonderful, artistic and courageous woman. She was a great influence on me and I miss her. It helps to know she is in Heaven, happy and free from pain and worries. Writers are well aware of the saying “write what you know?” Well, my Mom built what she knew and loved. Widowed at a young age, she started a very successful art supply and picture framing shop. You see, Mom was a passionate artists. That’s what she knew. She began to paint when she was fourteen and her love of painting lasted until she could no longer hold up a paintbrush. That’s a lot of years to put paint on canvas and paper. She created oil paintings, watercolors, a few batiks and even some collage work, but Mom’s favorite medium was acrylic. The Group of Seven strongly influenced her work, possibly because one of the famous members taught her at the Banff School of Fine Arts during two summers. His name was A.Y. Jackson. If you don’t know who he is, look him up. Quite the artist. Quite the group. Over the years Mom compiled photos of every painting she made. All were categorized and cataloged. (Someday, I’m going to count how many there were, but it will take some time.) When she sold a painting, she penned a tiny ‘s’ in the corner of the corresponding photo. No big “SOLD” written across the picture, just something nearly imperceptible. That was Mom. She never boasted about her abilities, though she’d sold hundreds of pieces of art over her lifetime. Any awards she won over the years at the Calgary Exhibitions or numerous other shows and competitions, she merely tucked away in an unassuming box. I wish I had taken more interest in Mom’s art. I wish I’d asked her what inspired her to paint that picture, or why she chose that particular medium or those colors. But I didn’t. You see, I grew up watching her paint in her small art studio next to the furnace. That’s what she did. She also cooked, cleaned and did a million other things. It wasn’t until I was in school that I realized not all mothers painted. And older yet when I understood that Mom possessed a wonderful talent. When we packed up her things, we put over 250 paintings into storage. What a wonderful legacy for her children, grandchildren and descendents yet to be born. But no artist wants their work hidden. They want it to be shared. And so that is what I plan to do. I hope you will indulge me because I’m going to post some of Mom’s paintings from time to time. I’m very proud of her, for so many reasons…one of which is her art. I think you’ll see why. Here are two of her paintings. Until today, I have never had the opportunity to interview co-authors before. As a writer I can’t imagine collaborating with another author on a book. Sure it’s nice to have someone to toss ideas back and forth, but to write as one member of a team seems insurmountable to me. 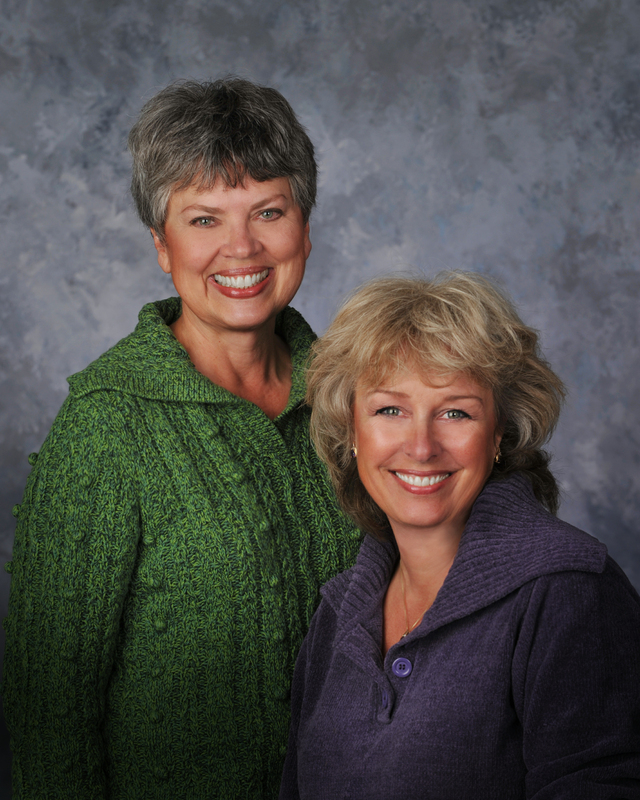 Yet these two gracious ladies have managed to publish several fantastic time travel books under the pen name, Morgan O’Neill. Let me introduce you to them. A chance meeting at a writers’ conference brought Cary Morgan Frates and Deborah O’Neill Cordes together, two award-winning authors who connected because of a mutual love of time travel fiction. Collaboration ensued, the search for a pen name the first step in their working relationship. Their maiden names provided the solution – and “Morgan O’Neill” was born. That’s an amazing list of awards for your time travel books. Well done, ladies! 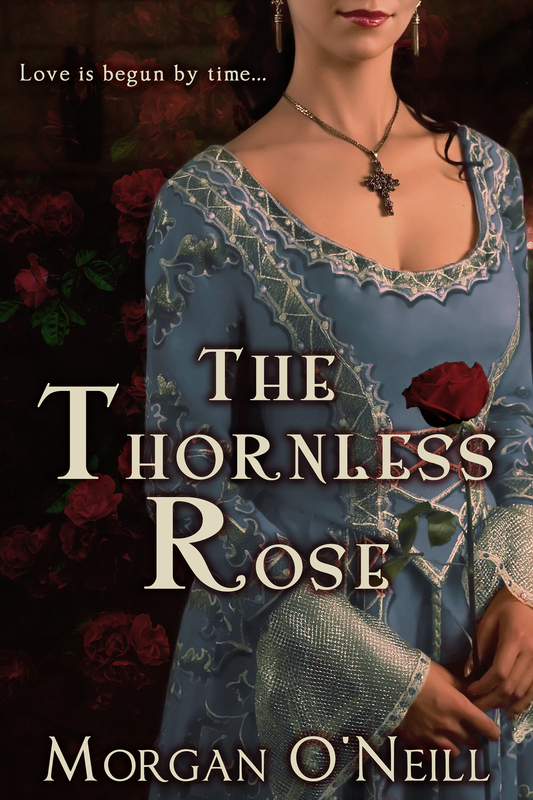 And here’s an exciting excerpt to encourage you to want to read more of The Thornless Rose, an Elizabethan Time Travel novel, by Morgan O’Neill. In this scene, time travelers Anne Howard and Dr. Jonathan Brandon are thrown together for the first time. Anne felt a tingling, a creeping of skin on the back of her neck and arms. She closed her eyes, suddenly feeling faint, when the air stilled beyond anything she had ever experienced. What the––? From darkening shadows, she gazed out. Oddly, the chapel was brilliantly lit by dozens of candles. Black-clad monks knelt on wooden misericords, praying. Their soft, collective droning was a counterpoint to her heart’s fierce drumming. The monks turned. To a man, their gazes cut through her, sharp and deeply suspicious. Anne took a deep breath and crossed into the light. Gasps exploded from the monks as they gaped at her shorts and bare legs. “Strumpet! For shame!” a monk shouted. Anne backed up, anxious to escape, and quickly turned to avoid the royal tomb directly behind her. She stopped and stared. The place looked nothing like before. Instead of a marble sarcophagus, there was a pile of broken stones heaped on the floor. She spun toward the monks, still frozen against their misericords. “Where’s the tomb? Queen Elizabeth’s tomb?” she croaked. But the young monk, Daniel, shook his head, eyes blazing. “Witch, I’ll send thee back to hell!” He lunged at Anne. Instinctively, she put up her arms, covering her face in a defensive posture. Then, in disbelief, she realized she felt nothing, no contact with her attacker. She turned just as Brother Daniel tumbled behind her onto Mary Tudor’s grave. She started, blinked, and stared. The monks had vanished, the crowd of tourists surrounding the queens’ tomb the same as before. She held out a trembling hand. Her skin looked as it’d always been—she was whole again. It took her a moment to get her bearings, to steady herself, but then a voice brought her fully around. “I’m fine,” Anne muttered, even though she knew she wasn’t. Shocked, she looked at her shaky hands, again solid, part of the here and now. She shoved them into her pockets and walked on. What just happened? She picked up her pace, intent on leaving. She shouldn’t have had that shandy on an empty stomach. The lights suddenly dimmed, the atmosphere hushed, expectant. Just like before! She halted in her tracks. Flickering candlelight and deep shadows, no tourists. The Abbey was even darker than it had been when she’d seen the monks. Stunned, she turned. A man in costume ran toward her. She stood transfixed. As he came closer, she recognized him—his eyes, the scar. He stilled her confusion with a tender brush of his lips, and she responded instinctively, their kiss deepening as her body arched against his, her blood ablaze with sudden desire, until the rest of the world seemed very far away. When he finally drew back, he stared into her eyes, and Anne’s heart seized when she saw his pain, the sheer desperation in his gaze. His fingers gently cupped her chin, his touch unleashing more heat. He lifted her face for another kiss, and then—nothing. He was gone. She fought for control, her breathing erratic, her legs threatening to crumble. She touched her lips, still feeling his caress, his soft breath on her skin, but he was gone. The lights flashed on, the tourists once again milling about, unaware. A small boy pointed at her, but his mother paid no attention. He knew me. But how? A chill enveloped her as the memory of the monk’s stare supplanted Brandon’s. Trembling, she left the Abbey. Cripes! I know how terrified and confused I’d be if I landed smack dab in the middle of another time and place. I look forward to reading A Thornless Rose to learn how Anne handles the situation. Plus I love a good romance! Okay, everyone. Listen up. Right now the publisher, Entangled, has The Thornless Rose on sale. You can get this marvelous book at its introductory $0.99 price. But this sale will soon end! So hurry on over to your favorite eBook store and get your copy now. Thanks so much, Deborah and Cary, for allowing me to showcase you both and this wonderful book. I know that you have a hectic writing schedule so I appreciate sharing this time with me. Here’s to many more successes with your books! There are numerous ways to find these authors (at least in this life and time). They have kindly supplied a list. We all know Christmas is a time for giving, but sometimes that’s easier said than done. What do you buy older people who don’t have room for trinkets? And what do you get those doing well who buy what they want throughout the year? I find it tricky. I wander aimlessly around the malls, trying to find that perfect gift to show how much I love and appreciate my family and friends. But here’s the thing. If I’ve been living my life correctly, they should they already know how I feel about them. I hope I’ve demonstrated many times through the year that they are a very important part of my life. Giving them something they really don’t need seems like a waste of good money. I know my hard-earned cash could be used more wisely. This year I donated approximately what I would have spent on their gifts to a charity they support. I’m pretty certain they’d be delighted to know that because I love them, I donated enough money to buy an eco stove for a person in Nicaragua or a goat for a family in Uganda. I know my family won’t miss another throw for their couch or a bottle of wine or whatever else I might buy them. And it feels great to know I’ve helped a person that desperately needs a hand up. You might want to try giving to a charity in someone’s name this year, too. If you’re not sure where to find charities to buy such things, here’s the one I used. My husband has gone with them to third world countries and seen first hand the good things they do. Hi, friends. It’s been a while since I’ve last added a post. Sorry about that. Life got a little too hectic for a while. I want to let you know that until Dec 1, 2014, my short story, Christmas Charisma is FREE. It’s about a young widowed mother who hopes to get through this Christmas without too much pain for herself or her little boy. It’s a heart-warming Christmas story that I think you’ll enjoy. Please take the time to download it and, if your upcoming Christmas season isn’t too busy, maybe you could “gift” me with me with some stars or even a quick review. Thanks! And in case you’re reading this too late, Christmas Charisma will also be FREE DECEMBER 12 AND 13. Merry Christmas, everyone! I wish you all the best in 2015! Today, Dawn Luedecke, is stopping by to meet you and to introduce you to her latest book, The Lighthouse Anthology, several love stories about light keepers. I ask you, have you ever read even one story about a lighthouse keeper, let alone four? I haven’t. But soon will. The LIGHTHOUSE ANTHOLOGY should be a great read! A country girl born and bred, Dawn Luedecke has spent most of her life surrounded by horses, country folk, and the wild terrain of Nevada, Idaho and Montana. As a child, she would spend many afternoons reading books, watching western classics, and Rogers and Hammerstein movies. When she grew up she decided to leave the quiet country life for a chance to find adventure by serving a successful tour in the United States Coast Guard. During that time, she found her soul mate (and alpha male) and started a family and writing career. She enjoys writing historical and paranormal romance and spends as much time as she can working on her current manuscript. For more information visit http://www.dawnluedecke.com. When violent ocean forces become too strong, the keepers are watching. They are strong, determined, and afraid of nothing. They will risk their lives to save others, and risk their chance at love to serve their country. Can love overcome the obstacles thrown in their path and shine the light in their hearts? They are the ladies of the Lighthouse Service and men of the Life Saving Service. Those who have vowed to watch and protect. *** And those keepers have saved the lives of many men and women over the years. Such an invaluable service! Beacon of the Night Alone in the world, Sylvia single handedly runs the Destruction Island Lighthouse. Courageously, she puts her life in danger to save shipwrecked sailors. When she rescues a man during a storm, she learns that this notoriously handsome Captain has a notorious secret. I Heard the Bells Ever since she was young, Abigail has been infatuated with her brother’s best friend Gavin Walker. She is the lighthouse keeper’s niece, and not at all inclined to join in the deadly ocean rescues. He is a local hero and second in command at the Lifesaving Station in Cape Disappointment. A place known to many as ‘The Graveyard of the Pacific’. Can Gavin help Abbie save her brother, and nurse her uncle back to health before Christmas? The Ghost ships Cry Wade Alston is keeper of the Little Island Life Saving Station. He is haunted by his past, and the spine-chilling cry of the ghost ship that lies just outside the shoreline. To top it off, a crewman from the wreck is missing, and the man’s wife and daughter, Laura, continue to plague his life with a request that is not only against the rules, but downright dangerous.Laura asks him to attend her father’s wake, and Wade becomes the victim of deception. During which, he finally gets the courage to tell her how he has felt for years. But will her desperation to find her father jeopardize any future they may have together? Burning Light Within Vanessa has taken on the task of Dry Tortuga Island’s lighthouse keeper in place of her late husband. As keeper, “Nessa” rescues those who find trouble in the warm Florida Key waters. The brave young woman is challenged by a man she saves from the water — a man from her past. Will he raise the longing she once felt, or will she be reminded of a past that once was but is no more? *** Dawn has kindly offered us more than one excerpt! Yeah! The sea looked dark, a catalyst for the abyss and the final resting place of the brave men surrounded by the dark waters. Davie Jones called to them, beckoned his crew to the afterlife of a sailor. He was the only one left, clutching the floating plank of his ship and desperate for survival. He would live to get his revenge on the bloodthirsty pirate who did this to his beautiful ship, The Justice. The sea grew angry, driven mad by the deadly storm that dominated the sky. Alex watched the waves, each one a wall of water as it reached to heights of up to sixteen feet, and the water cold enough to slow his body. He looked up and saw the land and flashing light of the lighthouse, a beacon of the night. They were close to shore when the storm—and the pirate—hit. Alex could see the dark outline of the land he needed to reach; his only hope for survival. He clung to the wood, buoyant against the raging ocean force. He kicked his feet and swam against the current, with no effect. He tried to reach the light. He struggled to keep his head up, his gaze on the horizon, and swim with all the energy he had left. His strength drained rapidly as the ocean temperature and physical exertion took its toll. No matter how hard he tried, it didn’t seem to work. The land stayed out of reach, and taunted him with its closeness. There is a breaking point in every man. He saw it on many occasions with his crew, but never thought he would experience it. Now he knew differently—this was his. Mere moments after he hit the ice-cold water, he wanted to give up and let God take him. He loosened his grip on the wooden plank and let his body sink. The water slid up to his waist, then chest, neck, and face. Just as his head sank below the water’s surface, he felt a sharp scrape against his back and he was pulled against the water’s current. Against his will, he reached the surface and glided across, to land with a thud against a wooden boat. These stories sound fantastic and even though they all involve a light keeper, each has a completely different plot. I really enjoy anthologies like this because I get a complete story without staying up half the night to finish it. Of course there are those times when I end up reading the entire anthology at once! So buyer beware, because all the stories sound intriguing. Thanks, so much Dawn for being my current guest on my blog. I wish you all the best with this anthology and your writing career. 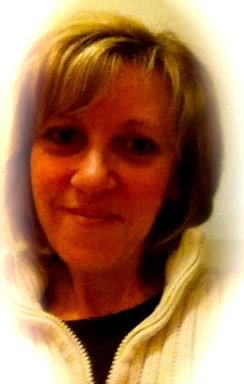 Angela Ford originates from Nova Scotia…Canada’s Ocean Playground! Her love of the ocean and sunsets are always in her heart and give her inspiration. Her love for words keeps her turning the page. She is never without a book, whether she’s reading or writing. Now residing in Ontario, Angela works in Finance – numbers by day – words by night. Her dedication to volunteer and involvement with cyber safety seminars gave her an Award of Distinction and sparked the idea for her first book Closure – suspense with a dash of romance that hit the best- selling Action/Adventure. Her next release, Unforgettable Kiss, delivers a romance with a dash of suspense. 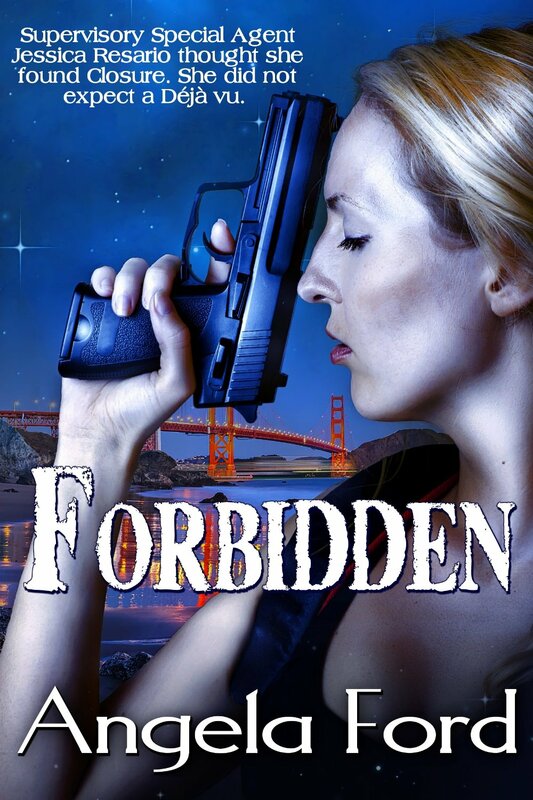 Forbidden released in June 2014…Closure’s sequel. Between two jobs, being a mom with a home always filled with teenagers and rather interesting stories; she is lucky to have one very patient and understanding man. 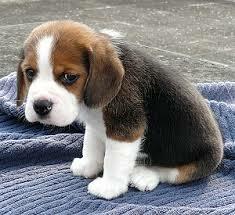 But it is the furry family members who rule the house – a Puggle, two loveable cats and two unique Guinea Pigs. Every possible quiet moment she finds, she treasures and just writes about the moments to come. Angela is an avid reader of romance, a member of the RWA and thrilled to be part of her new family BTGN. She continues to deliver spine-chilling seminars to parents about cyber safety. One seminar introduces her to Tiffany Bennett’s parents who are quite concerned for their daughter’s safety from an Internet Predator. Jess leads the team to protect Tiffany and discovers that the past can creep back into your life. “Thanks Tom. You always know what I need. I love you so much.” She smiled and reached for his hand. Just his presence in the room warmed her from the cold chill she felt. “I love you too.” He leaned down and kissed the top of her head. “At this time of night?” Jess looked at her watch. Sounds like a timely story considering all the creepy predators on-line! Thanks, Angela for being a guest on Carol Presents. It’s always a pleasure getting to know more about our author acquaintances. I look forward to reading more of your books.